Photograph taken by William Hoyle Garber showing the Mt. 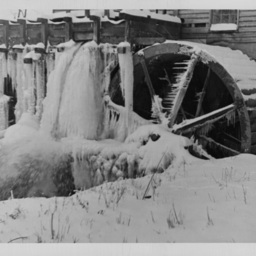 Jackson Mill Wheel frozen in the waters of Mill Creek. S.P. Lonas' Mills Dam, Mt. 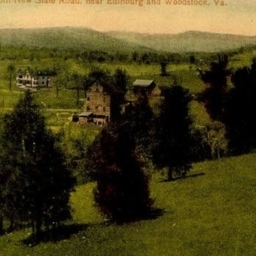 Jackson Va.
Postcard showing S.P. Lonas' mill dam located on the Shenandoah River near Mt. Jackson Virginia. 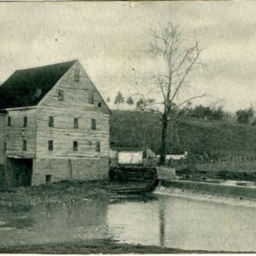 Postcard with a picture of the Edinburg Mill. 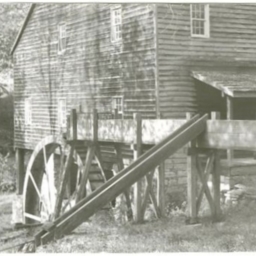 The card also includes a description of the mill and a brief history. 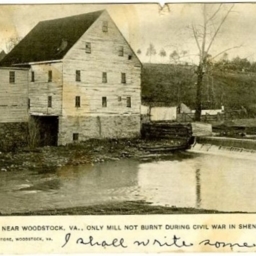 Whissen Mill, only mill not burnt during Civil War, in Shenandoah Valley, near Edenburg Va.
Postcard with a picture of the Whissen Mill located between Edinburg and Woodstock Virginia located on Stoney Creek. 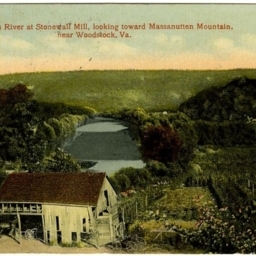 Postcard with a picture of the Whissen Mill located between Edinburg and Woodstock Virginia on Stoney Creek. 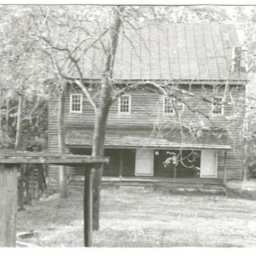 Billed as the only mill not burnt in the valley during the Civil War. 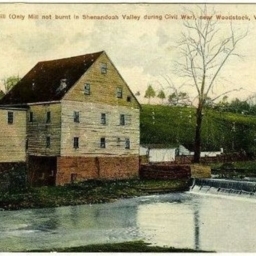 Color postcard showing the Whissen Mill located between Edinburg and Woodstock Virginia on Stony Creek. Last used as a power plant. 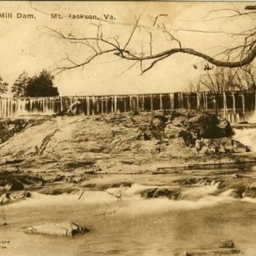 A color postcard showing the Stonewall Mill Dam located south east of Woodstock Virginia on the Shenandoah River. 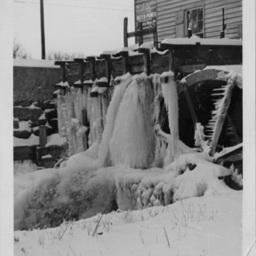 The dam was used to produce electricity during its later years. 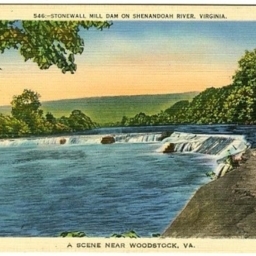 Color postcard with a picture of the Shenandoah River at the Stonewall Mill which was later used to produce electricity for the area. 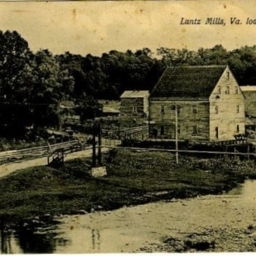 Photographic postcard showing the Maurertown Mill located in Maurertown Virginia. 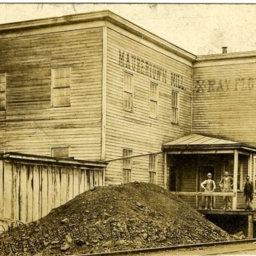 The three men shown in the postcard are, from left to right, _____ Trussell, Lee Sager owner of the mill, and Sam Funk the mill foreman. 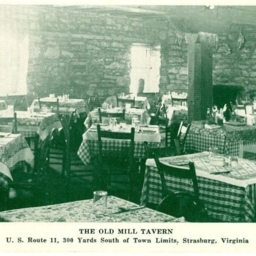 Postcard showing a picture of the interior of the Old Mill Tavern located in Strasburg Virginia. 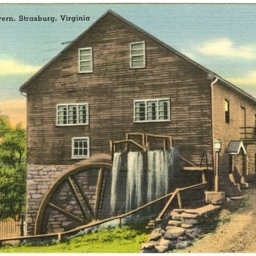 Color postcard with a picture of the Strasburg Mill at the time it was home to The Old Mill Tavern restaurant. 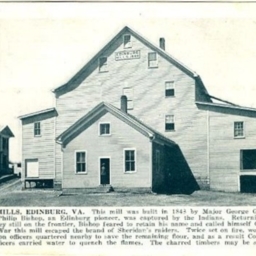 Postcard showing a picture of the Strasburg Mill at the time it was home to the Old Mill Tavern restaurant. 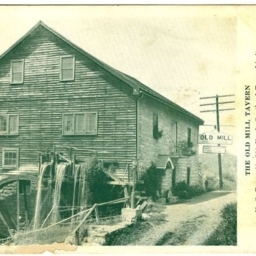 The card includes a description of the mill and its history. 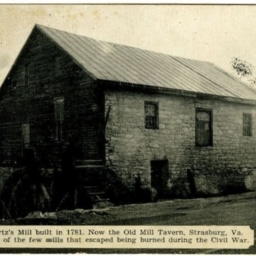 Postcard showing the Artz Mill, aka the Strasburg Mill, at the time it was home to the Old Mill Tavern restaurant. 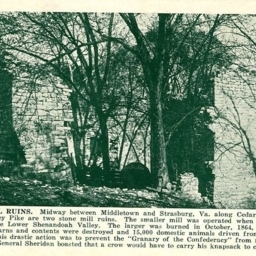 Postcard with a picture of the ruins of the Stickley Mill, located along Cedar Creek near Strasburg Virginia. The card also includes a description of the site and its history.